Case Update: Former Van Wert Co Dog Warden Sentenced | YesBiscuit! Six cats in a trap on the floor of the Van Wert Co Humane Society, photographed by the Van Wert Co sheriff’s office on July 20, 2014, as shown on limaohio.com. Regular readers may recall that last year Rich Strunkenburg, the dog warden for Van Wert Co in Ohio, was indicted on 4 felony counts of animal cruelty. Strunkenburg was reportedly tossing animals into cages and leaving them there with no veterinary care, food, or water, to suffer and die in their own waste. On July 20, 2014, a concerned citizen contacted the sheriff’s office, which oversees the pound, and that’s when investigators discovered the dead and dying animals. The prosecutor said at the time of indictment that due to the severity of the crimes, he would argue for the maximum sentence of 4 years in prison and a $10,000 fine. In a plea deal, Strunkenberg pleaded guilty last month to two felony counts. 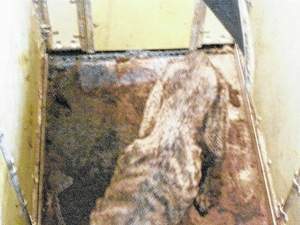 Emaciated dog in filth at the Van Wert Co Humane Society, photographed by the Van Wert Co sheriff’s office on July 20, 2014, as shown on limaohio.com. At sentencing, the judge noted that nothing in the investigation indicated Strunkenberg ever asked for help or tried to improve the situation at the pound. The question of supervision on the part of the sheriff’s office remains unaddressed. Strunkenburg was on the job for 12 years. It seems reasonable to believe that this level of cruelty and neglect did not arise in a vacuum the day before the sheriff’s office investigated the citizen complaint. Whose responsibility was it to provide supervision to Strunkenberg for the past 12 years and what action has been taken against that person for failing to do his job? Will the sheriff’s office bother providing any supervision to Strunkenburg’s successor? Taxpayers need to hold their elected officials and public servants accountable for these horrifying failures and demand guarantees of transparency and meaningful reform. 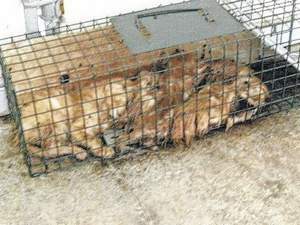 Otherwise, there would seem to be little hope for the animals at the Van Wert Co pound. Sounds like a mental health evaluation might be in order for him, but as you point out, where was everybody else while this was going on? Only 90 days??? Excuse me – he was responsible to the tax payers, they were paying him to do his job. He stole from them!! Wonder also, how many of those animals were there legally???? Thank you for the update! Happy that somebody has been held accountable!! Baby steps towards enlightenment?? Keep up the good work…. Ohio has crappy animal laws. It’s a damn shame he didn’t get more. 90 days? and he thinks there were some things he could have done a little better? This is nothing more than a slap on the hands. One has to only look at those photos to see the reality of what the animals suffered. Very disappointing . . . very. Horrible. The punishments & fines for animal abuse are not strong enough all across our country. Do these situations fall under local laws, state laws, or federal laws? Maybe all of our rescue groups nationwide could get together & compose a recommended set of laws for animal protection & for the punishments that would be recommended for each violation of those laws. If this could be circulated around the country to all animal rescue groups, maybe each of those groups could work together in their own district & state to have this “Animal Abuse Standard of Crime & Punishment” approved by their own area’s law & judicial systems. It seems to me that others should have also been held responsible for negligent oversight. I’ve said it before and I’ll keep saying it, the most dangerous predator on earth is a human without a conscience. From the picture he doesn’t look like he missed a donut! Guess he took the sitting eating donuts part of the Police job too seriously. This is a total case of FAIL! From the Sheriffs office to the warden to the JUDGE- hope his retirement is fraught with hell- all these losers are on the taxpayers dime!! And there is NOT one comment posted on the article- and that speaks columns about the city and it’s inhabitants. A nukeable place. The punishment doesn’t fit the crime! I don’t believe that he didn’t know this was that bad!